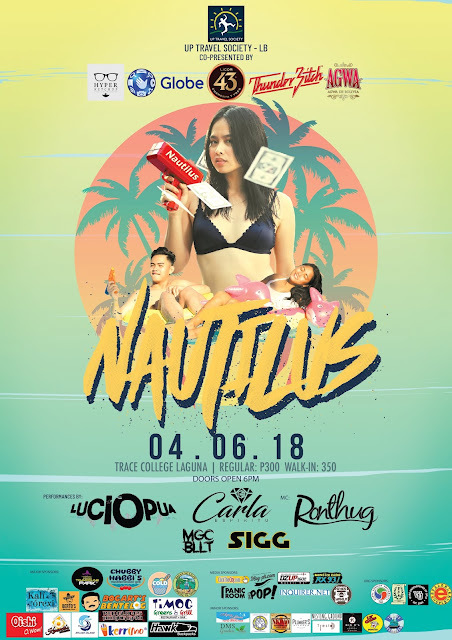 The University of the Philippines Travel Society Los Baños in partnership with Globe Telecom, Hyper Ketchup Event Productions, Licor 43, Thunder Btch and Agwa de Bolivia once again brings you the grandest summer pool party in South Luzon – NAUTILUS. Blog-PH.com is one of media partner of this event! Nautilus is an annual all-night fund raising pool party in the South with over thousands of attendees from all over Luzon. Previous installments were attended by celebrity hosts along with performances from the country’s top DJ’s such as Marc Marasigan, Ron Poe, Deuce Manila, Travis Monsod and Lucio Pua. Now on its third and final installment, NAUTILUS 2018 will surely be the talk of the town. Break out that summer OOTD you’ve been dying to wear and hang loose with us on April 6, 2018 at Trace College, Los Baños. You’ll be dancing the night away to the infectious beats of DJ LucioPua, DJ Carla Espiritu, DJ MGCBLLT and DJ Sigg. Tickets will be sold at 300 pesos and the drinks will be free-flowing all night long! Drinks will be free-flowing? You heard that right! Go and make your summer worthwhile! Hello, i believe that i noticed you visited my blog thus i came to go back the desire?.I'm attempting to in finding issues to improve my site!I guess its ok to use some of your ideas!! Your method of telling everything in this article is actually good, every one be capable of easily be aware of it, Thanks a lot. Hi there very cool website!! Man .. Excellent .. Superb .. I will bookmark your website and take the feeds additionally? I am glad to find so many useful info here in the publish, we need develop more strategies in this regard, thank you for sharing. Wow, that's what I was looking for, what a material! present here at this web site, thanks admin of this web site. What's up i am kavin, its my first occasion to commenting anyplace, when i read this post i thought i could also make comment due to this brilliant article.